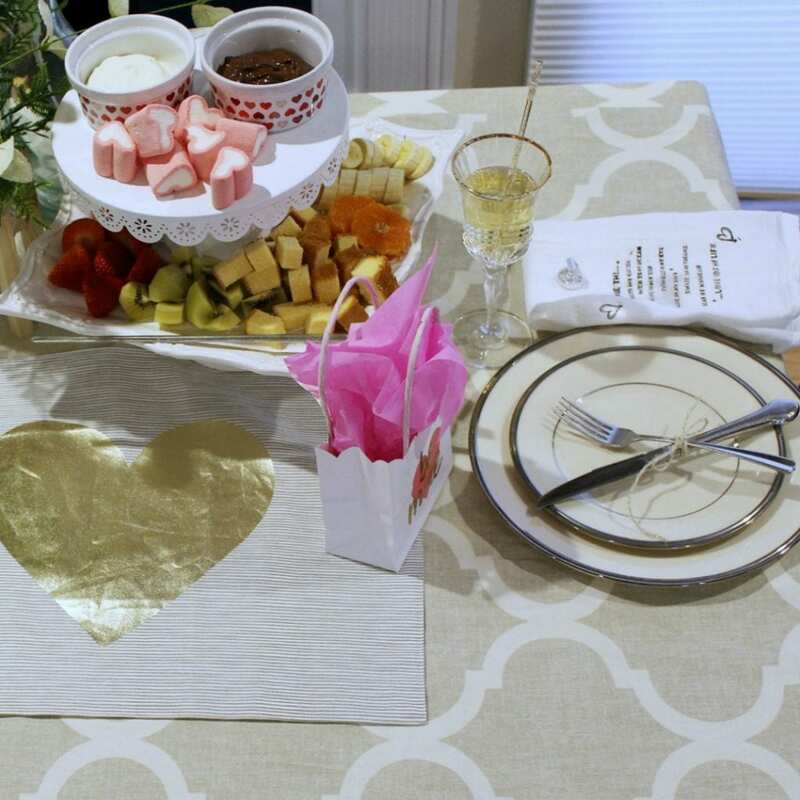 These Happy Galentine’s Day table decor ideas will help you celebrate all your best-est girlfriends in style this February 13th. Ladies celebrating Ladies! My husband and I have mixed feelings about Valentine’s Day. Our shared thoughts on the day were the first thing we bonded on and sparked our first conversation! Throwing a Happy Galentine’s Day party, though, sounds SO fun to me. Ladies celebrating Ladies and all that! I’ve wanted to host one forever. This February, I’m doing it! Not sure what Galentine’s Day is? 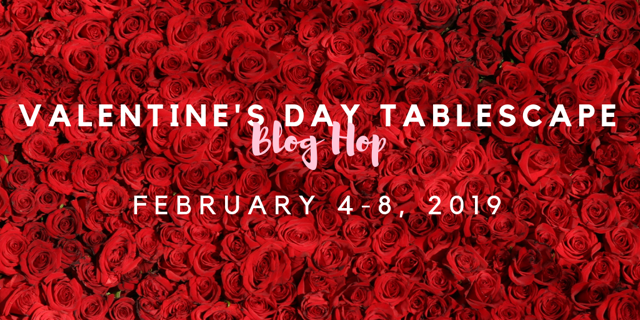 Scroll down for my Happy Galentine’s Day party ideas – my tablescape for this year’s Valentine’s Day Tablescape Hop, hosted by dear Chloe from Celebrate & Decorate! 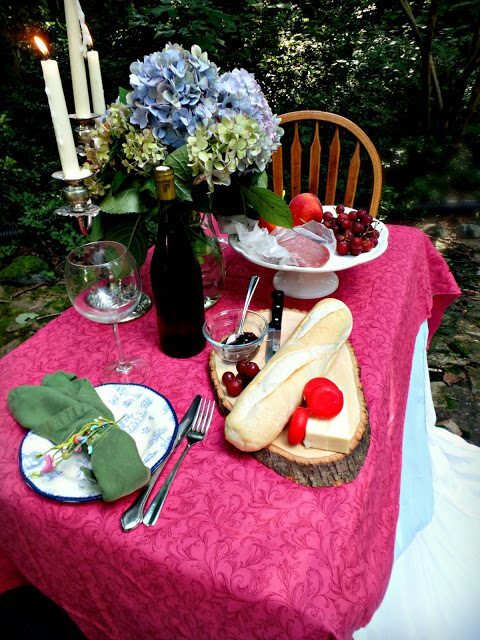 Be sure to scroll down to see the other Valentine’s Day tablescapes – there are new settings all week so check back often. To add even more fun, I’ve added downloadable Cheesy Pickup Line Place Cards, perfect for your Happy Galentine’s Day Celebration to my Goodies (Resource) area. The file contains eight different cards, featuring ridiculous pickup lines we’ve all heard at least once! Not on my list? You can get them HERE. 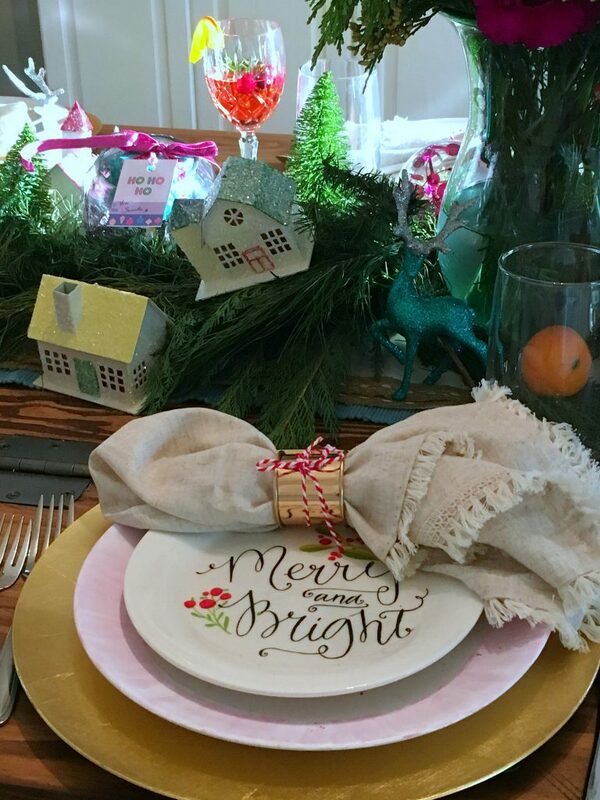 The table runner is a quick, easy DIY – I used a length of inexpensive canvas, hemmed with stitch-witchery, and added heart-arrows with a sharpie. Less than hour yielded an adorable holiday accent! Click over here for directions on how to make your own. Tulips are my FAVORITE at this time of year, with their bold colors and casual yet formal stature, they are my spirit animal of flowers. My REAL spirit animal is a goat.. bahh? But, I digress. I have fancy china, but hardly ever use it. 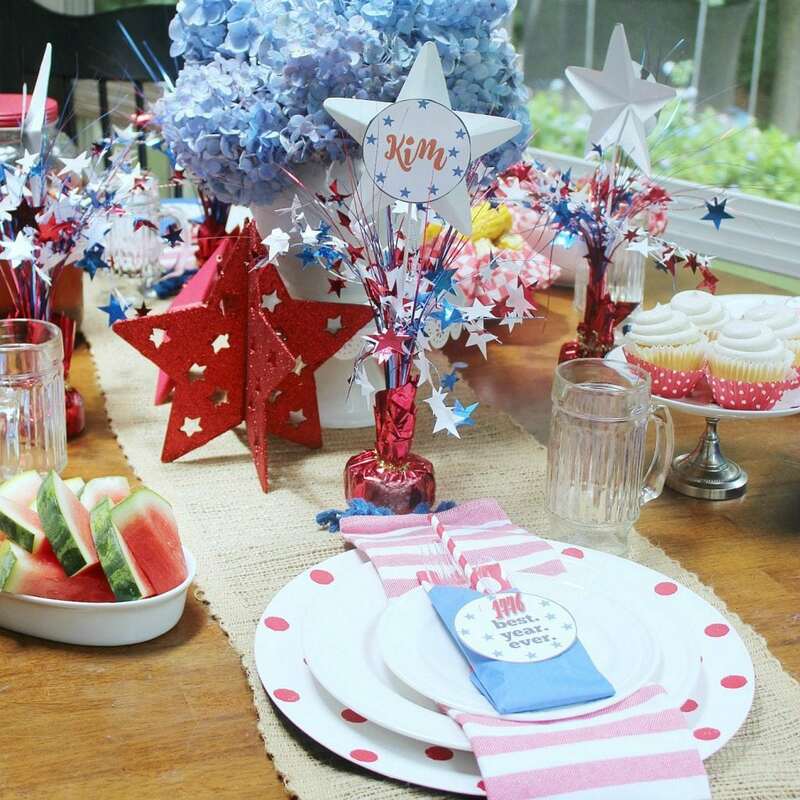 Instead, I love to pair colorful dessert and salad plates with plain, white, every-day dinnerware. 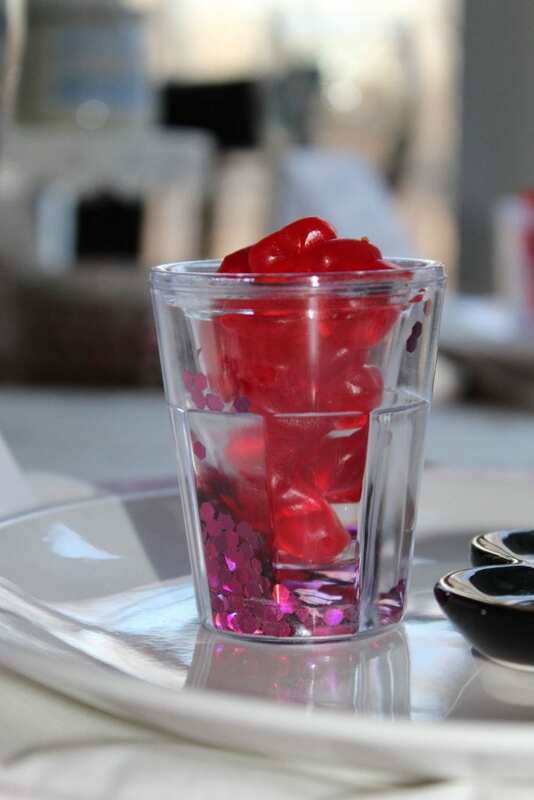 For this setting, however, I reversed it and went with these DIY colorful dinner plates and white salad plates, topped with a gold-rimmed black heart and a glitter-filled shot glass of gummy hearts. Black and cream scalloped napkins add a teeny bit of elegance. Black glass goblets add a little drama. My favorite flatware makes another appearance. It’s still hard for me to believe it’s disposable! I went simple on the menu. 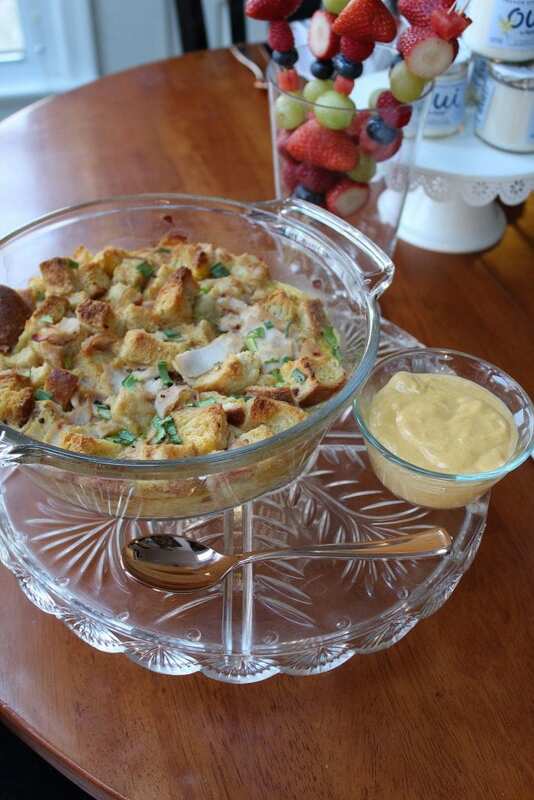 My main dish – grain-free Eggs Benedict Strata from Celebrations with hollandaise sauce by Danielle Walker. There is literally nothing in this book that isn’t amazing! 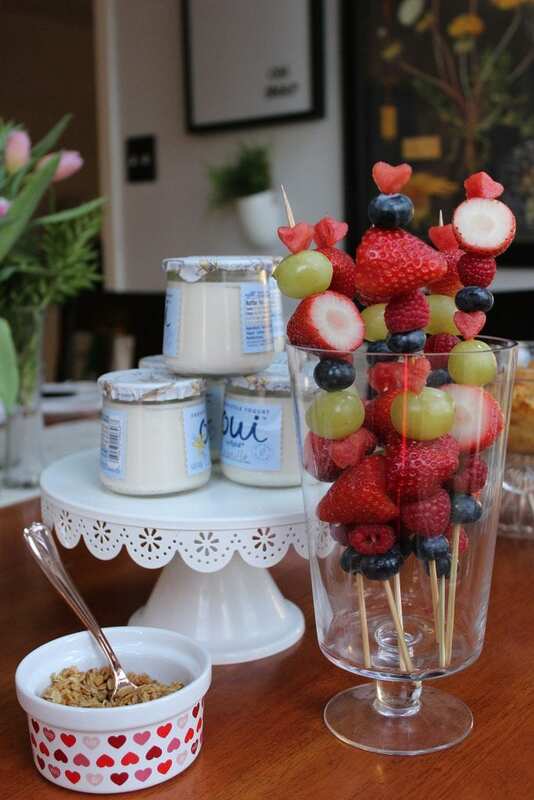 To save time, I went with store-bought pecan sticky buns, Yoplait Oui vanilla yogurt served with a side of granola and fruit kabobs topped with watermelon hearts. No Valentine’s or Happy Galentine’s Day would be complete without sweets. 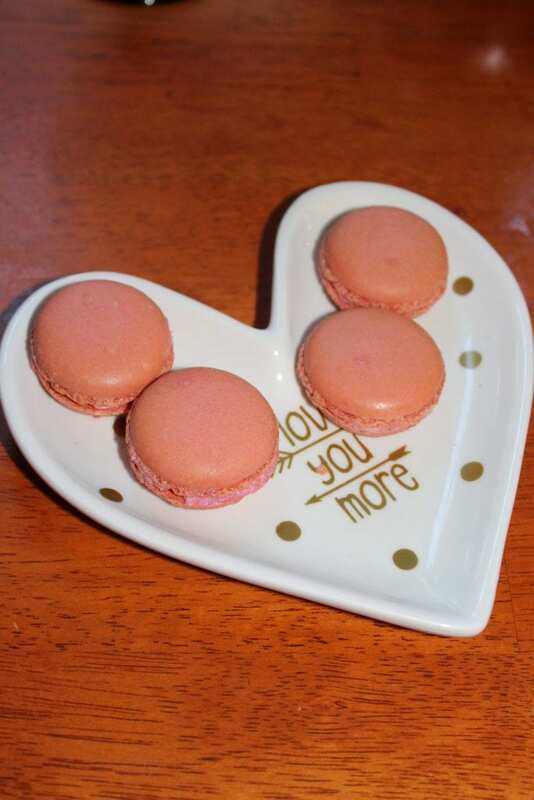 Strawberry macaroons, with crisp and chewy perfection, are perched atop this DIY Hearth Plate. A brunch essential, my mimosa bar started with my favorite prosecco. I included orange, grapefruit, or and cherry juice to mix things up! I’ll also have Sparkling water for those looking for the taste of and bubbly of mimosas but not the alcohol. 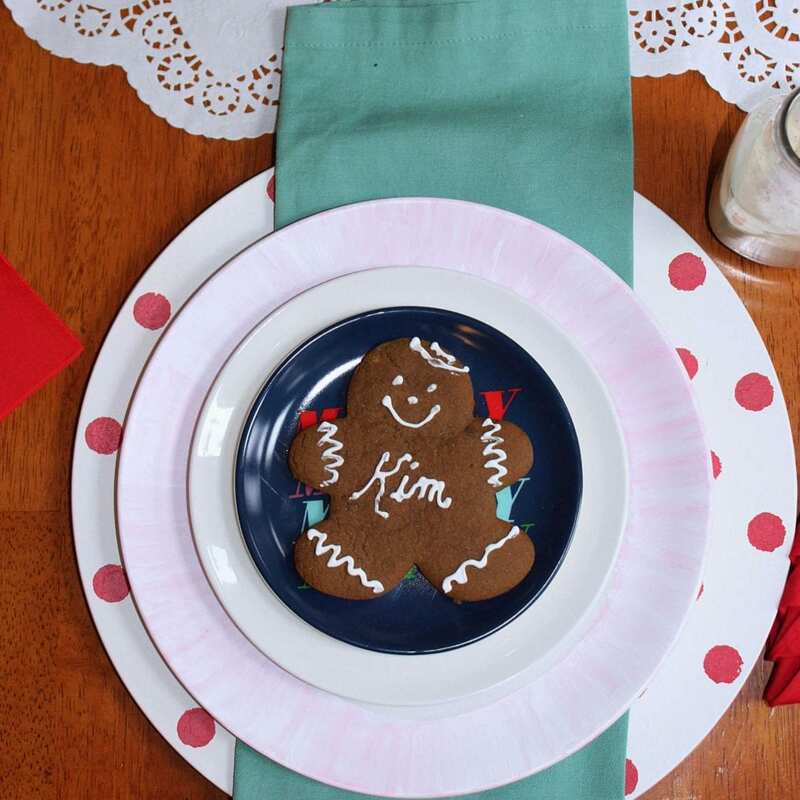 Embellished with adorable, cheeky, cheesy pickup lines you and your gal-pals will be giggling and rolling your eyes over these DIY Happy Galentine’s Day place cards. They are available for free download to my mailing list subscribers. Click here to get your copy! I’m so excited to get the Happy Galentine’s Day party started. In the words of Leslie Knope: “Ovaries before brovaries. Uteruses before duderuses.” Forever, Amen. Now, bring on February 13th! Who’s your bestie and how will you be celebrating Galentine’s Day? 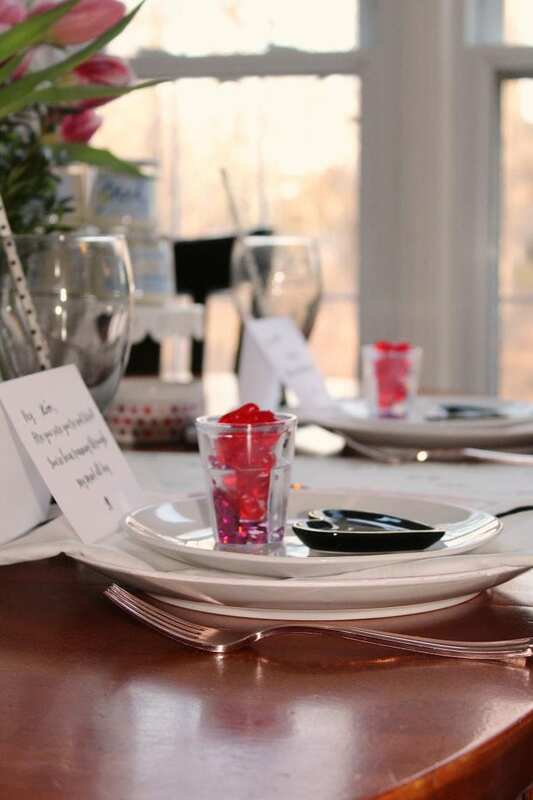 PS: don’t forget to take a peek at the other Valentine’s Day Table settings. Thanks for stopping by! 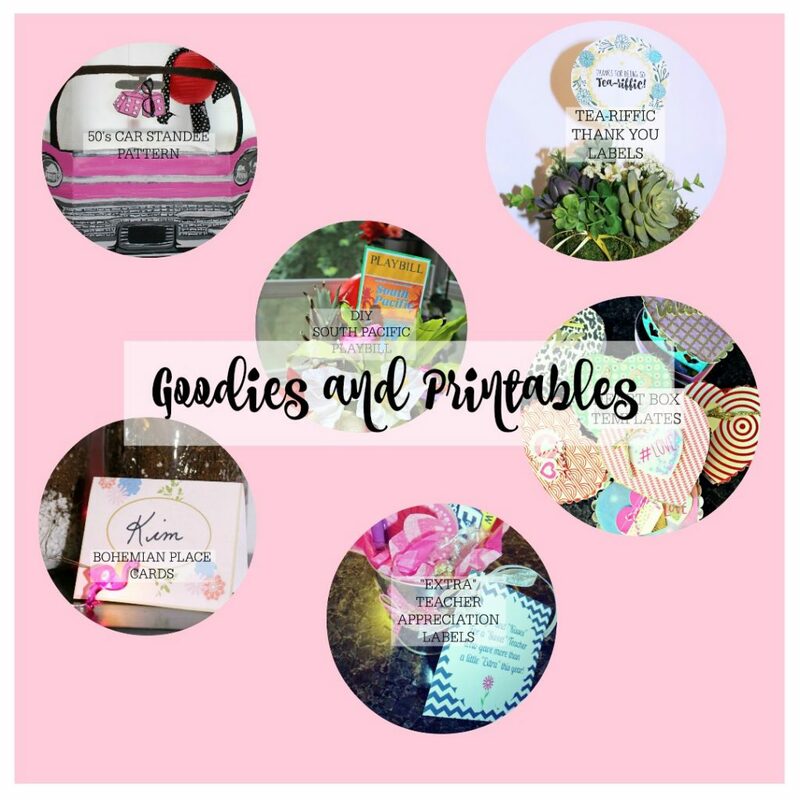 This post may contain affiliate links, which means that I make a commission when a sale is made by clicking on the link, at no additional cost to you. I value you and your trust and only recommend products and brands that I genuinely love. Thanks for supporting Knock it Off Kim! Like this post? Enter your email address to get access to our freebie area and monthly newsletter! It’s non-stop Knock it Off Kim fun! Yes! 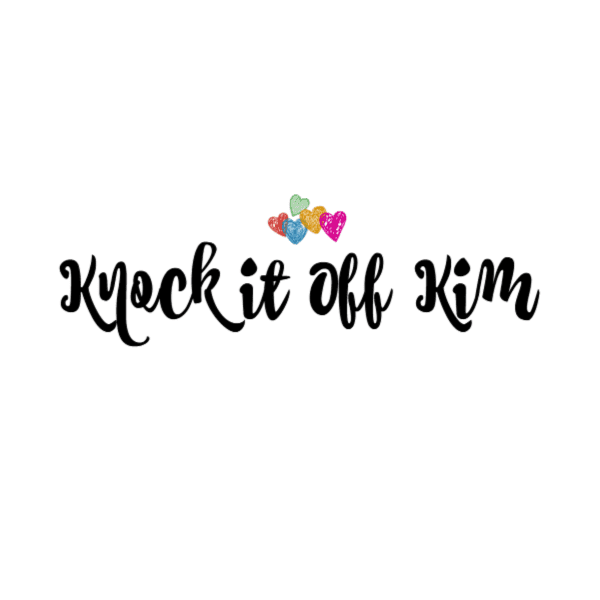 I want to receive news, promotions, and updates from KnockitoffKim.com. You can withdraw this consent at any time. KnockitoffKim.com will use the information you provide on this form to be in touch with you and to provide updates and marketing. Let us know what format you prefer to receive your email in! Kim, can I come to your party?! Oh my, I love every single thing about this playful, yet sincere, message of thanks to all the women who hold us up through everyday ups and downs. 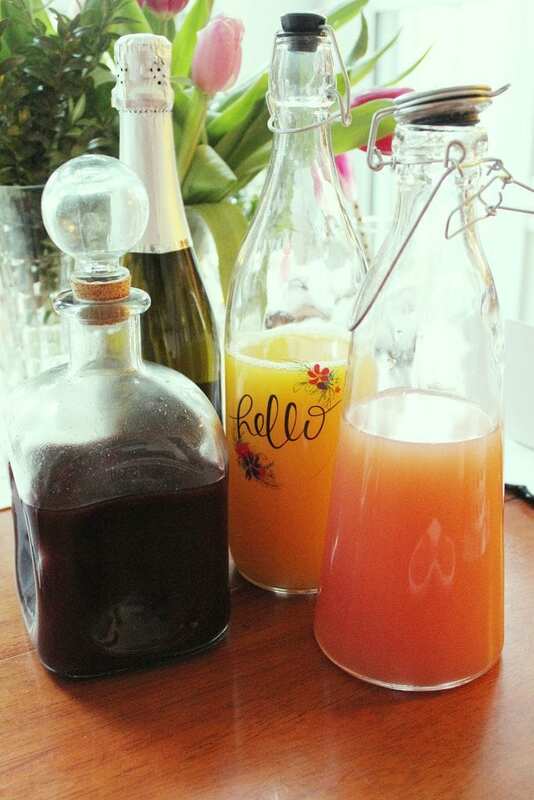 The menu (those mimosa bar choices – one of each, please! 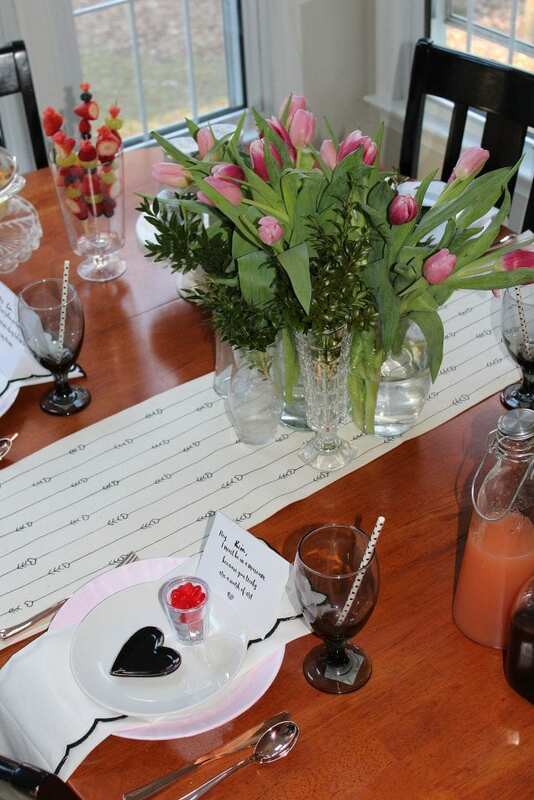 ), including those cute kabobs with hearts; that table runner (so very creatively simple! 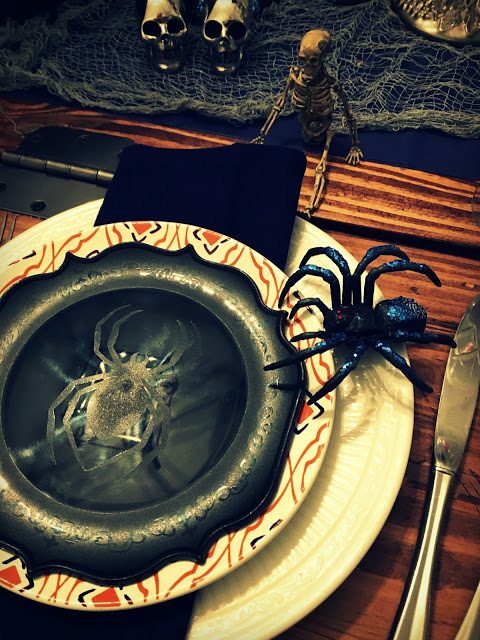 ); the place cards (a hoot!, great conversation starters); and the table settings themselves – this would have the girls talking for days, weeks afterward about what a great time spent. Bravo. 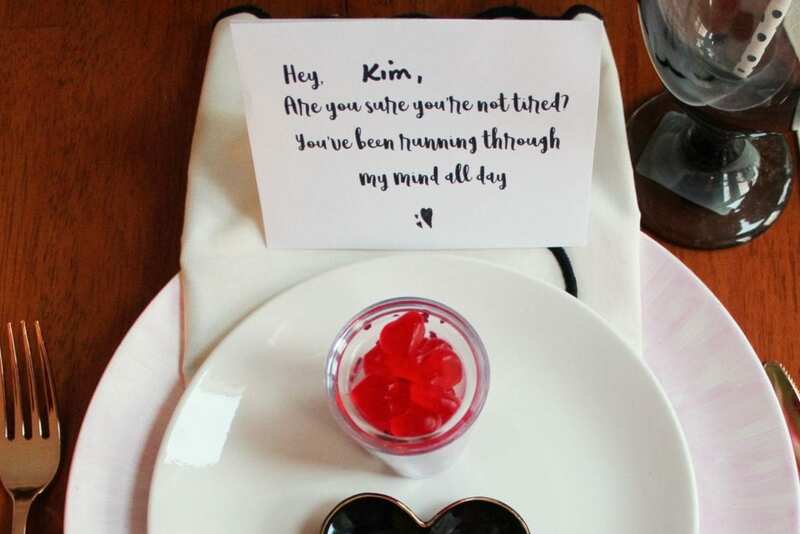 Kim, I laughed out loud at your pick up lines, too clever and perfect for Galentine’s Day! Your sharpie heart and arrow runner is super fun, affordable and festive too. Love your pretty tulips. Brunch looks delicious too especially with your Mimosa Bar. It’s always a treat to blog hop with you. Happy Valentine’s Day! How fun! 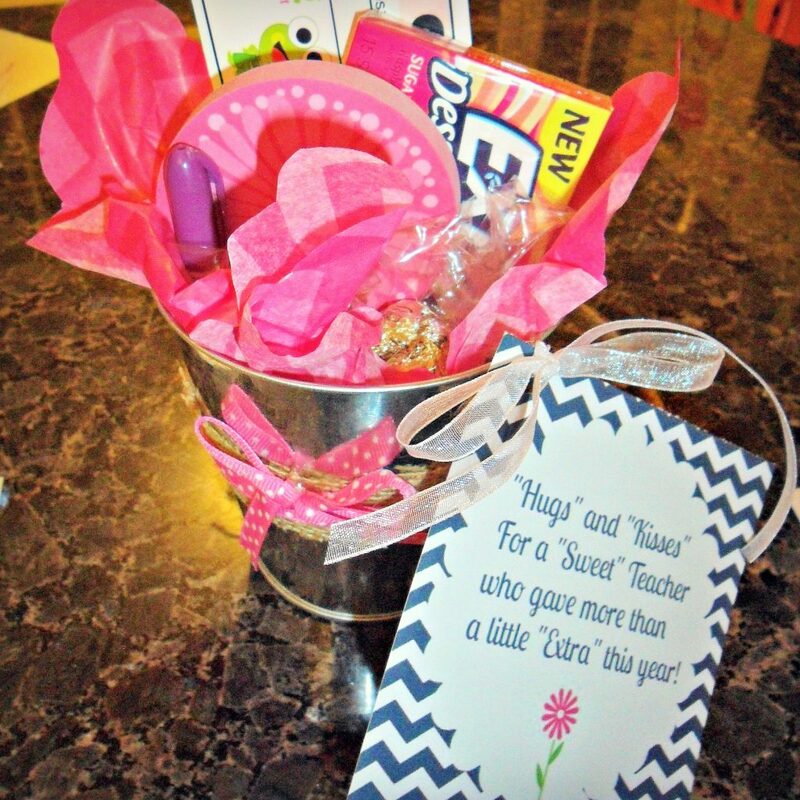 Your pick up line place cards are a hoot! Your tulips are fabulous, wishing I had that gorgeous bouquet ? right about now, kind of dreary here! 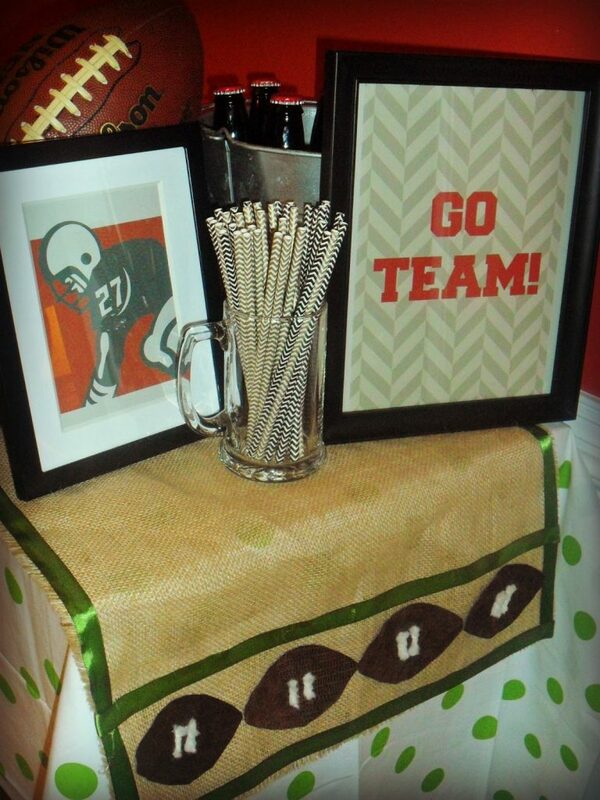 Love your table runner, then to find that you made it!!! Great idea!!! Mimosas are always a good idea!! Enjoy!! Second try, your blog didn’t accept my first comment because of the ‘at’ sign in my signature line. Very pretty. Kim, your friends are going to love this party that you are throwing for them. 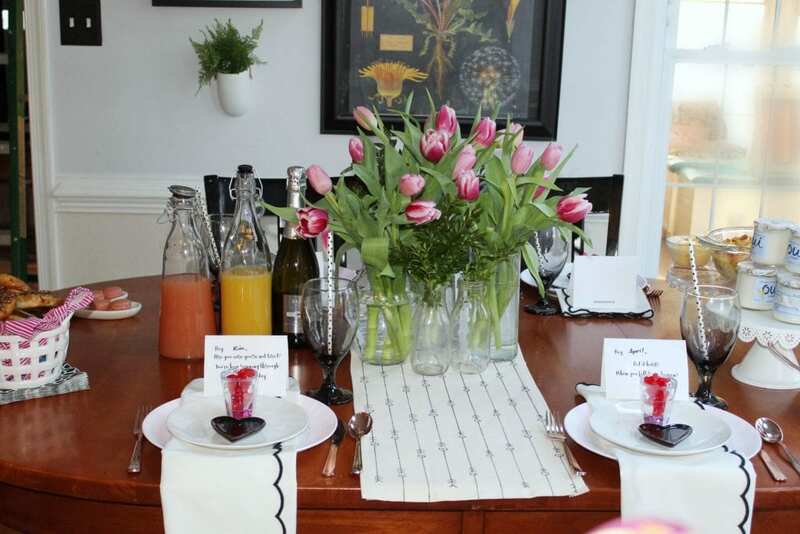 The runner is a great DIY and the tulips are the perfect centerpiece. Your menu sounds so delicious! It is always a pleasure to blog hop with you! Happy Valentine’s Day! 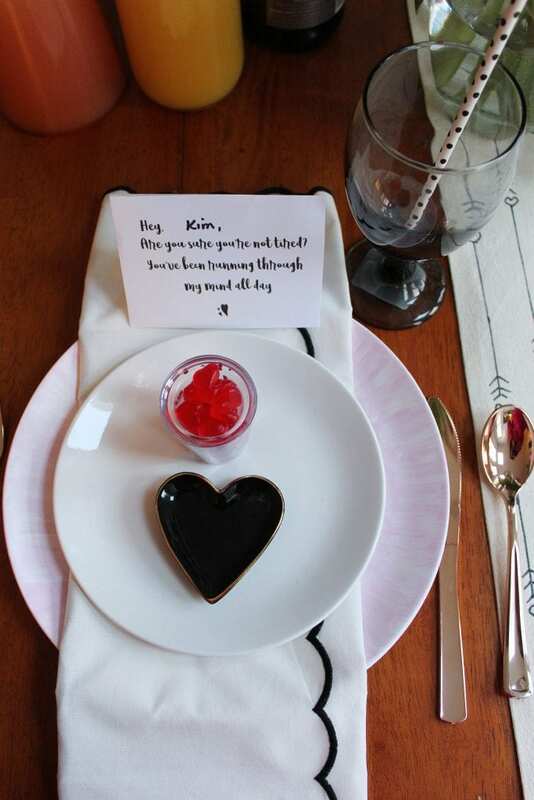 How sweet this lovely table is, especially with the sweet little Valentine notes you added to each place setting. The menu sounds and looks so yummy! Bring on the Bellinis! I love how you have arranged your tulips like they are so casual in the individual bottles! 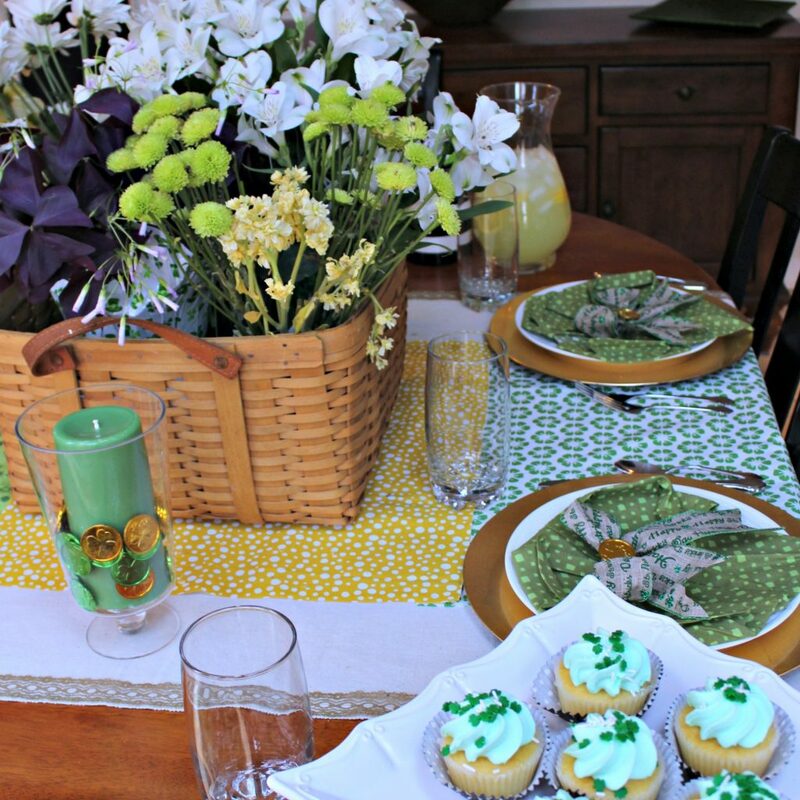 Thank you so much for joining another hop and sharing your table styling talents with all of us! Kim, Your party looks wonderful! You have inspired me to have a Galentine’s party! Great ideas as usual. You are so creative! Kim I love your pick up lines…so cute. 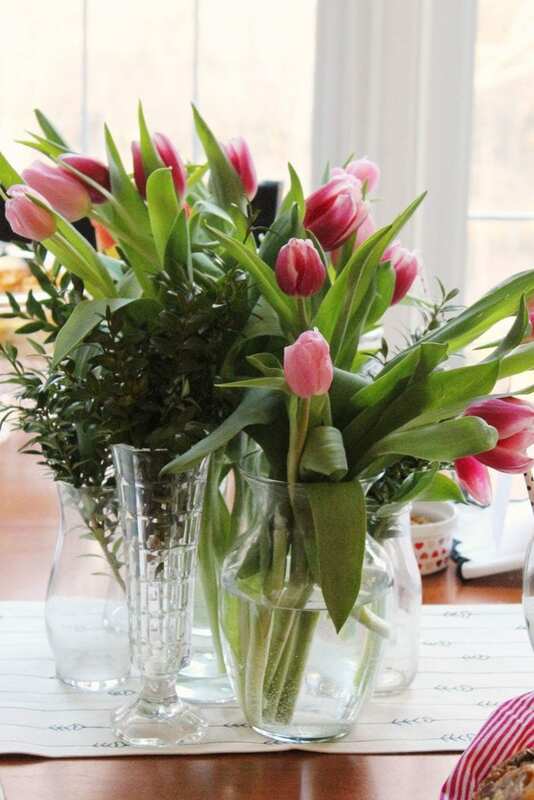 Your tulips are perfect along with your black and pink decor. Great job for your gal pals. It is always a pleasure to blog hop with you. Kari @ Me and My Captain. Kim, what a fun time exclusively for the ladies. So much love among friends. And such a lovely breakfast. It is so welcoming. 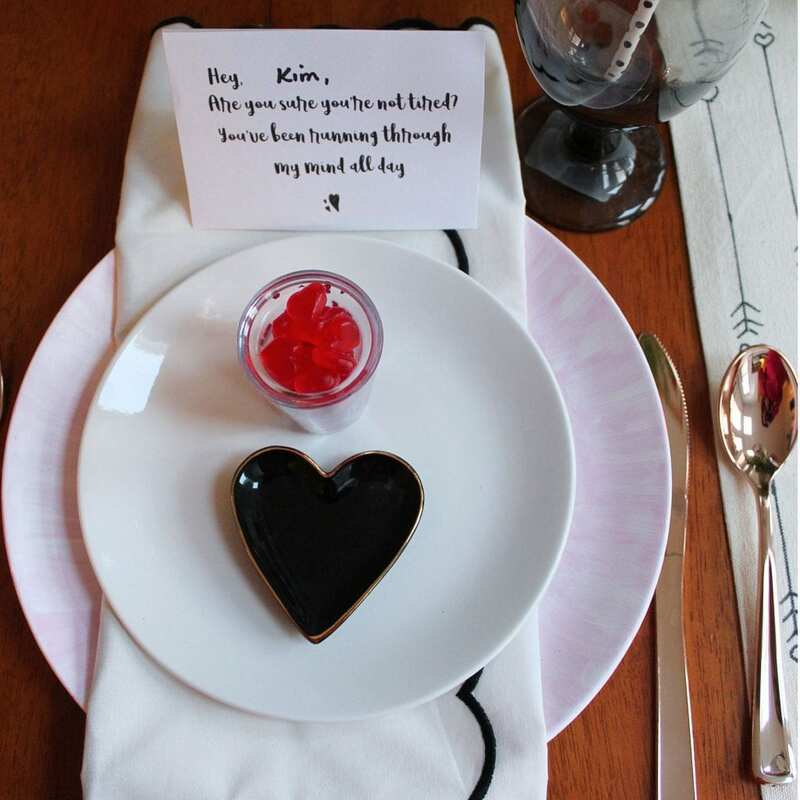 I love all the wonderful and cozy touches like the tulips, warm-hearted note cards, scalloped napkins and, of course, the gummy hearts, of which I am such a fan. Your table runner is perfect for your table. What a beautiful time for just the ladies. Enjoy and Happy Valentine’s Day. Oh my goodness those pick-up lines are hilarious! I’ve never hosted a Galentine’s event but I sure do want to. The canvas runner looks expensive and tulips this time of year are a real treat. If you hadn’t mentioned the flatware wasn’t real I wouldn’t have guessed it. It would be hard for me to part with it as well. Kim, what a fun Galentine’s day party. Loving your cheesy pick up lines. The fruit kabobs are fun! 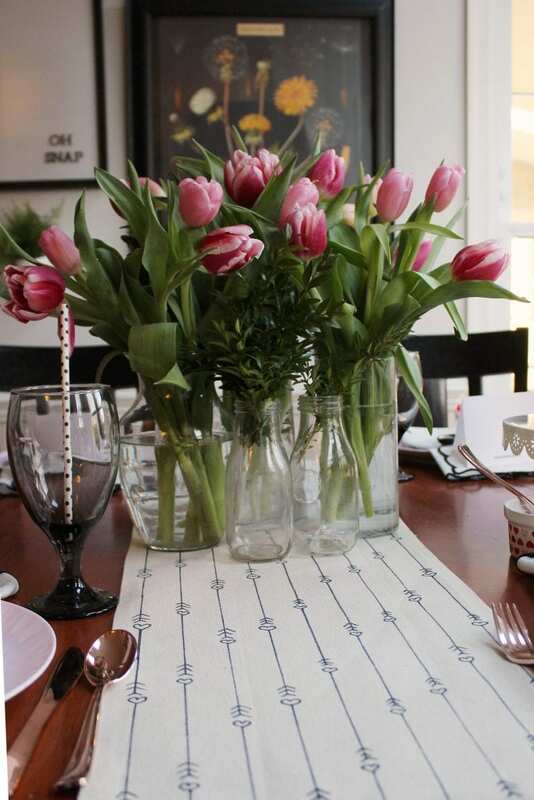 Tulips are so cheerful and add so much beauty to the table. 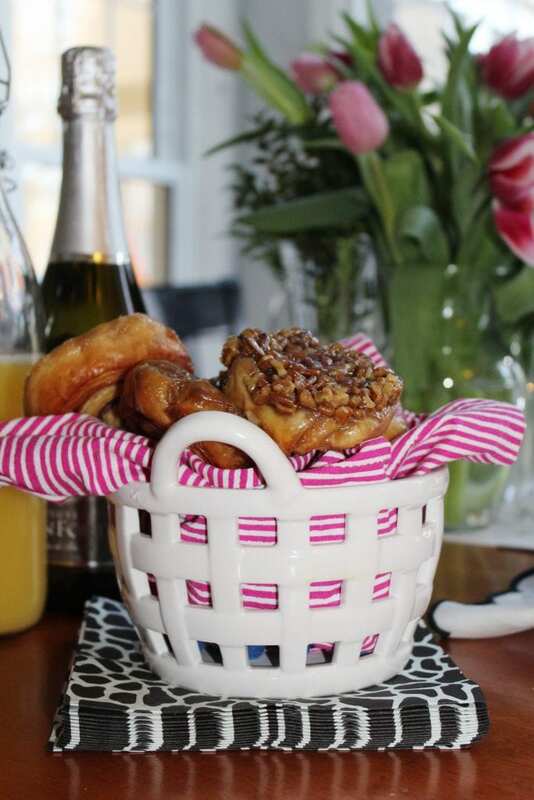 What a lovely breakfast planned for your gal pals. 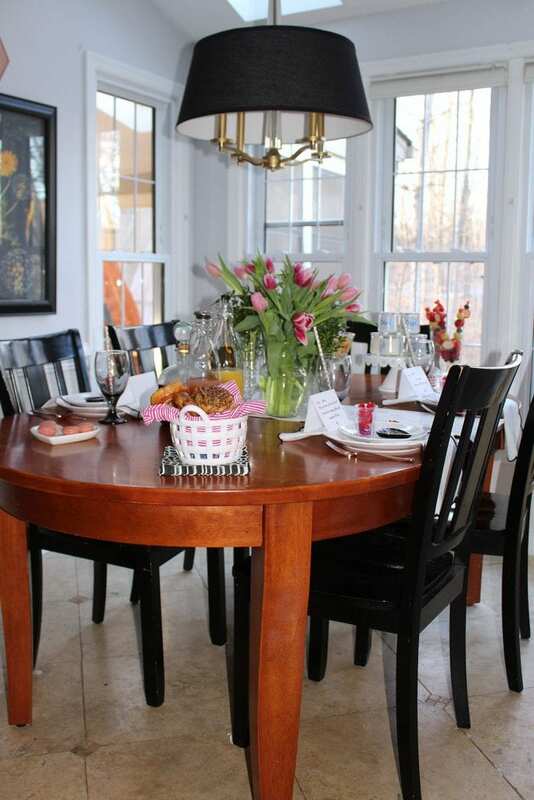 Kim, I had so much fun viewing your delightful post, table and menu. Oh. My. 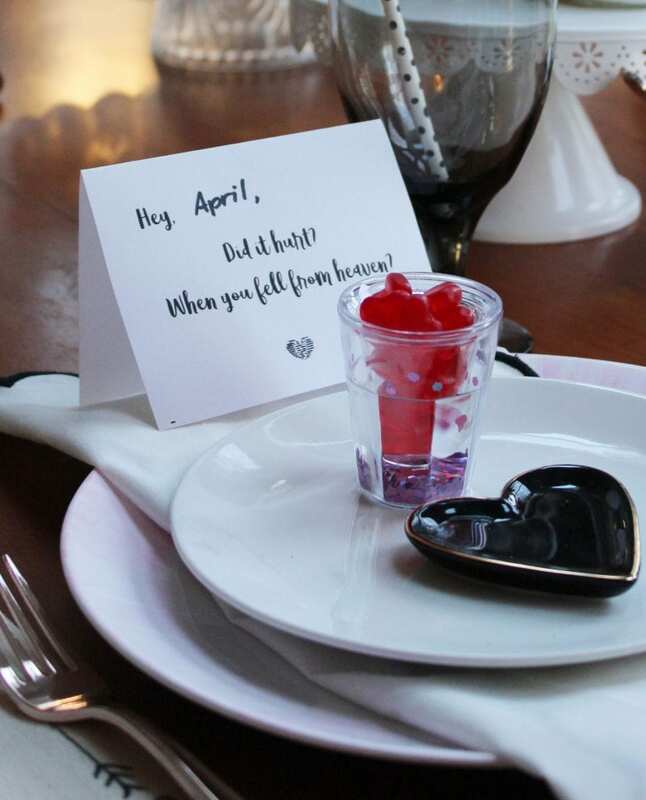 Goodness, what a riot those pick up lines are and how clever to use them as place cards! It’s been a looooong time since anyone tried a pickup line on me! Of late it’s more likely some creepy guy on Facebook or Instagram wanting to friend me… yuck! What a wonderful time you and your besties will have. Kim, thanks for providing the background of Galentine’s Day (I’ve never watched Parks and Rec). What a great idea! I can have the girls over for breakfast after the kids go to school. 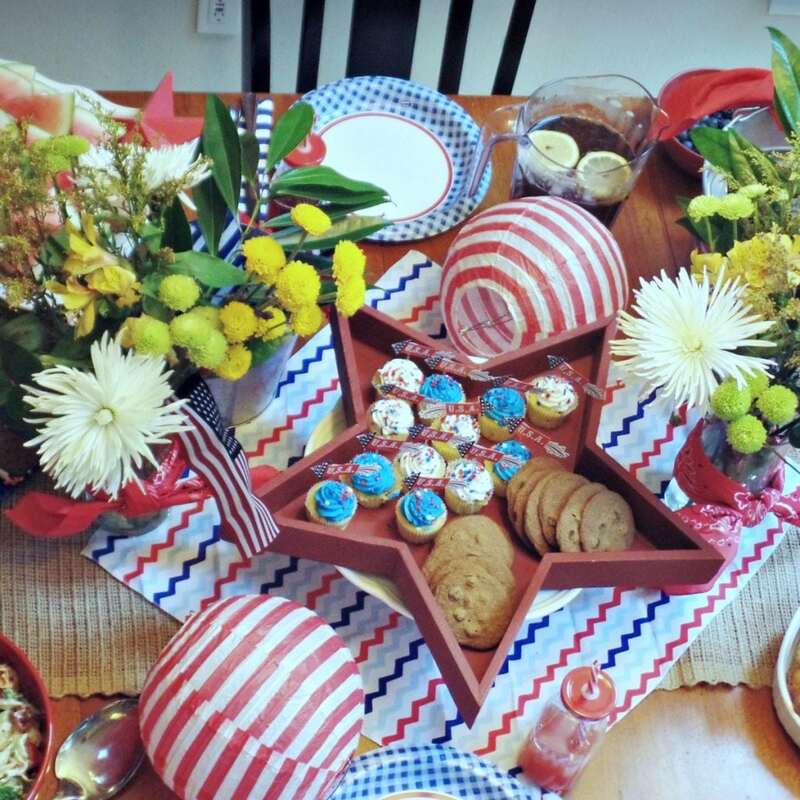 I just love everything about your table! The strata and sticky buns are making me hungry. 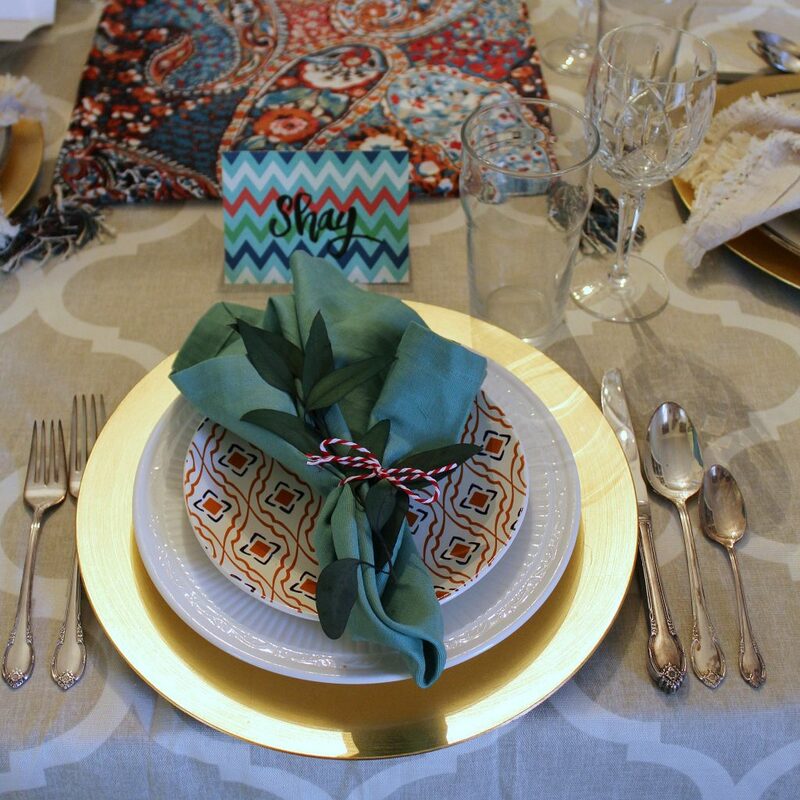 I’m so impressed that you made the table runner…you must have very steady hands!. It is so cute and just perfect for a casual girl’s breakfast. The cheesy pick up lines made me laugh, too. So clever! It’s a pleasure hopping with you. Happy Valentine’s (and Galentine’s) Day! Oh my goodness, Kim! I want to come! It looks like such a fun party. 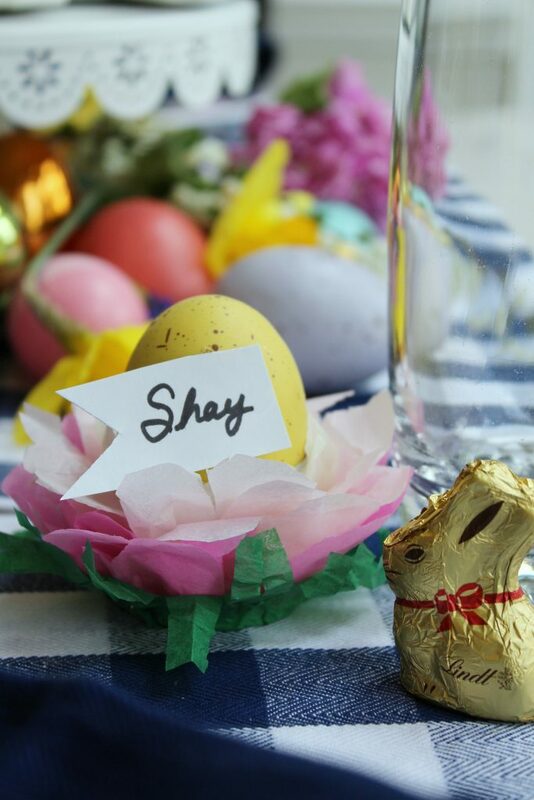 I love all of the details…from the cheesy pick up line place cards to the amazing menu. You have thought of everything! I hope you enjoy a very Happy Galentine’s Day! Your friends are very lucky ladies, Kim! 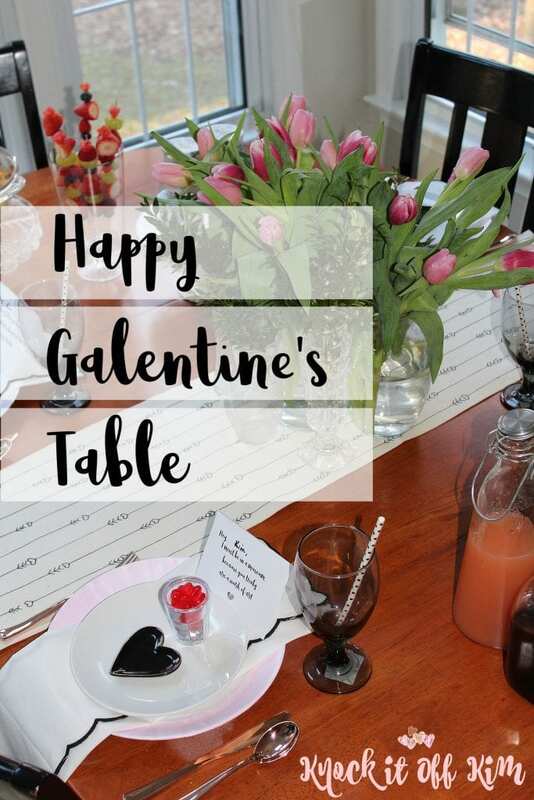 Have a wonderful Galentine’s day with this perfect tablescape! 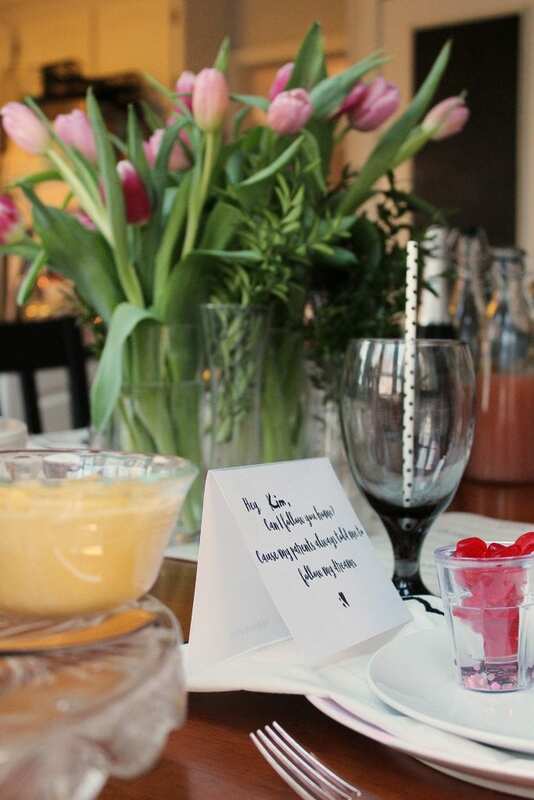 Any table with fresh pink tulips and fresh fruit is perfection to me! So many cute ideas here Kim! 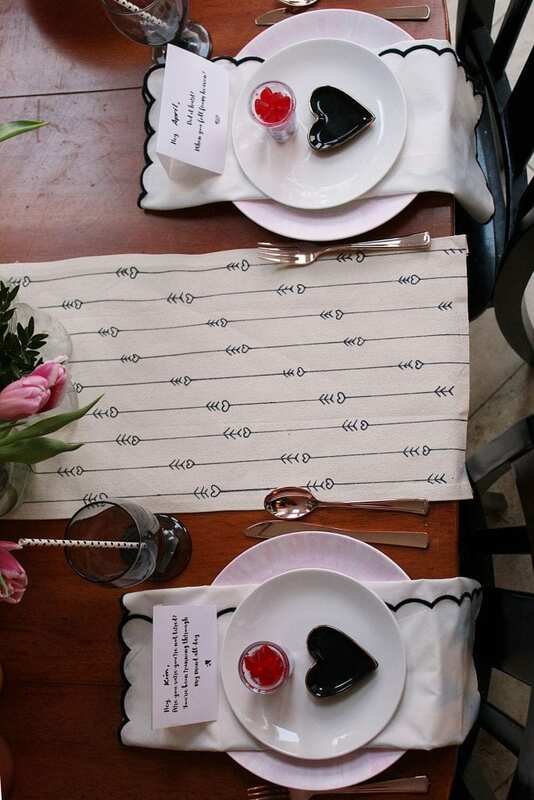 I love the black and white touches, especially the scalloped napkins. So happy to hop with you! I hope you have a Happy Valentine’s and Galentine’s Day! 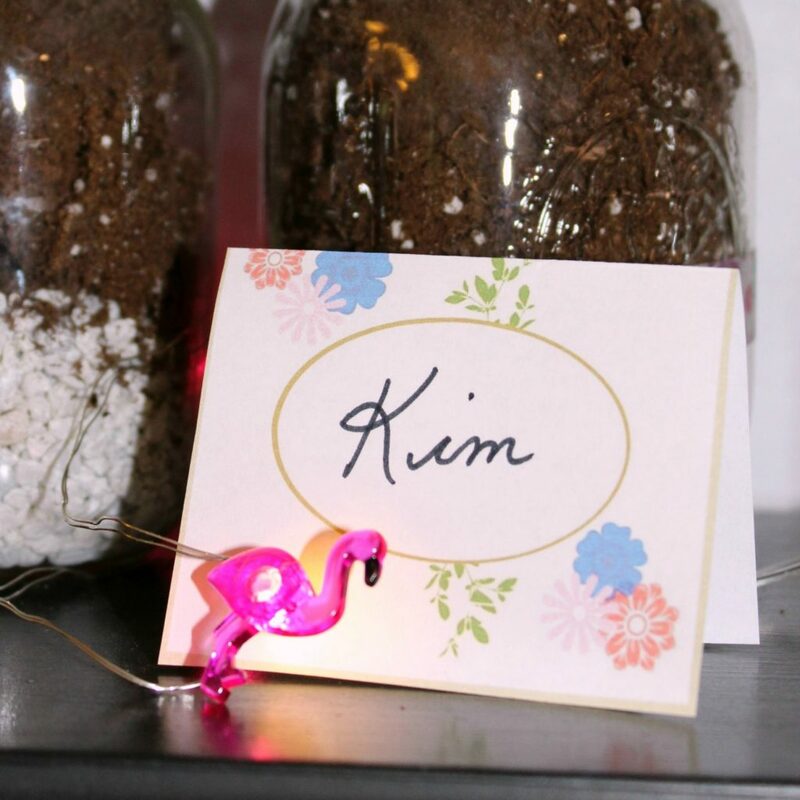 I’m Kim and I love to decorate, celebrate and make fun, colorful things. 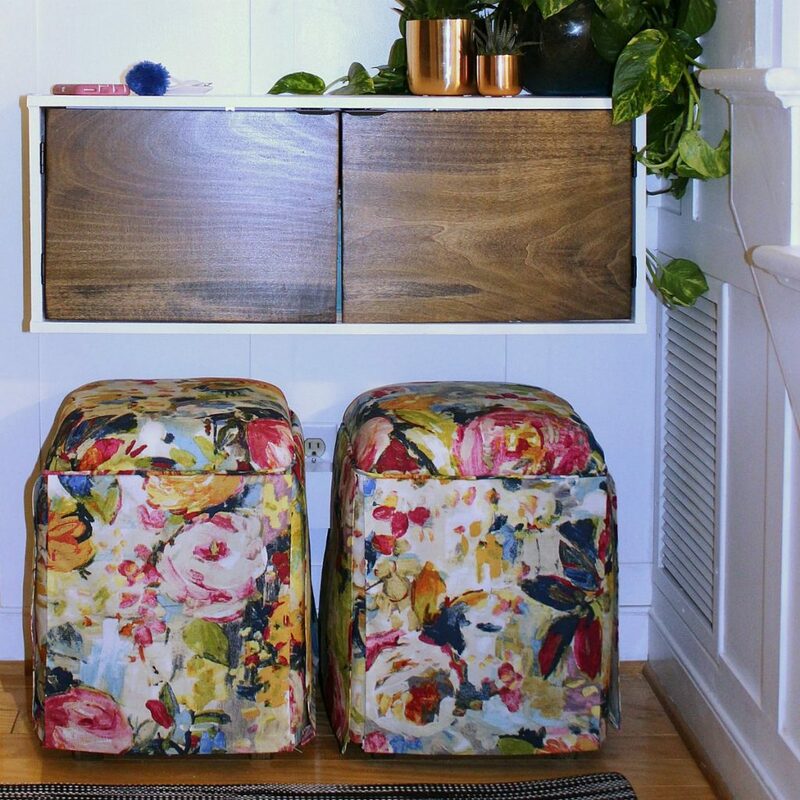 Come along as I attempt to make life more beautiful, one DIY project at a time. Almost there! Enter your information below to start your instant download! 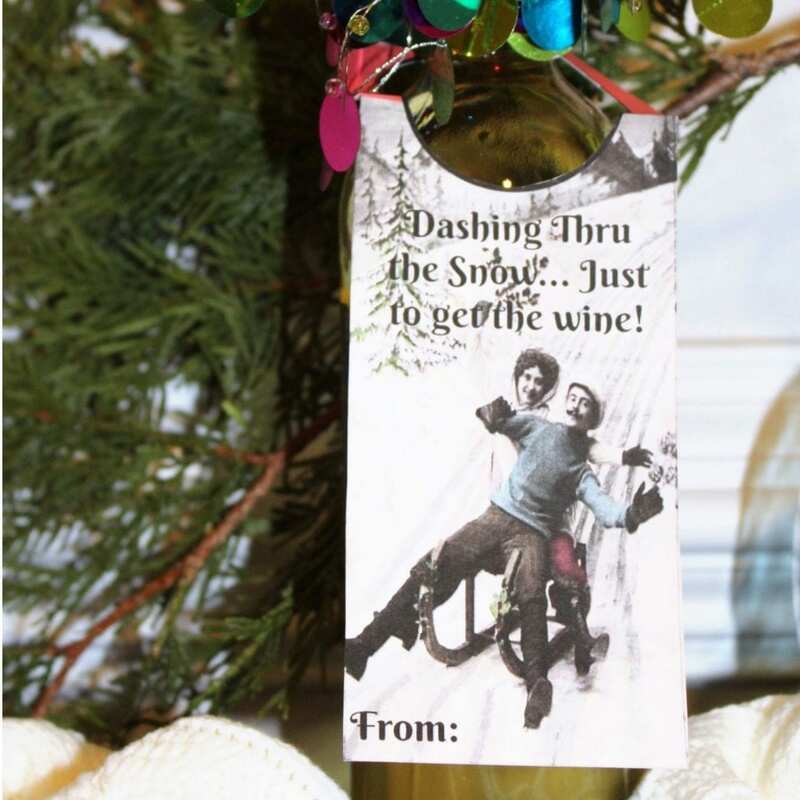 Sign up to get your free Tea-riffic Gift Labels! 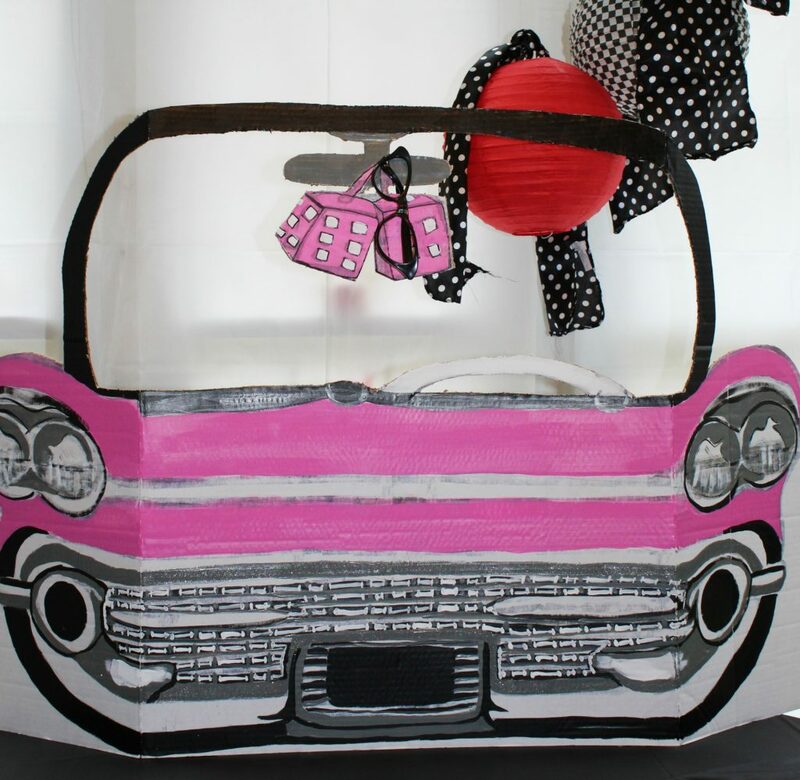 Sign up to get your free 50s Car Cutout Pattern! Sign up to get your free Bohemian Place Cards! 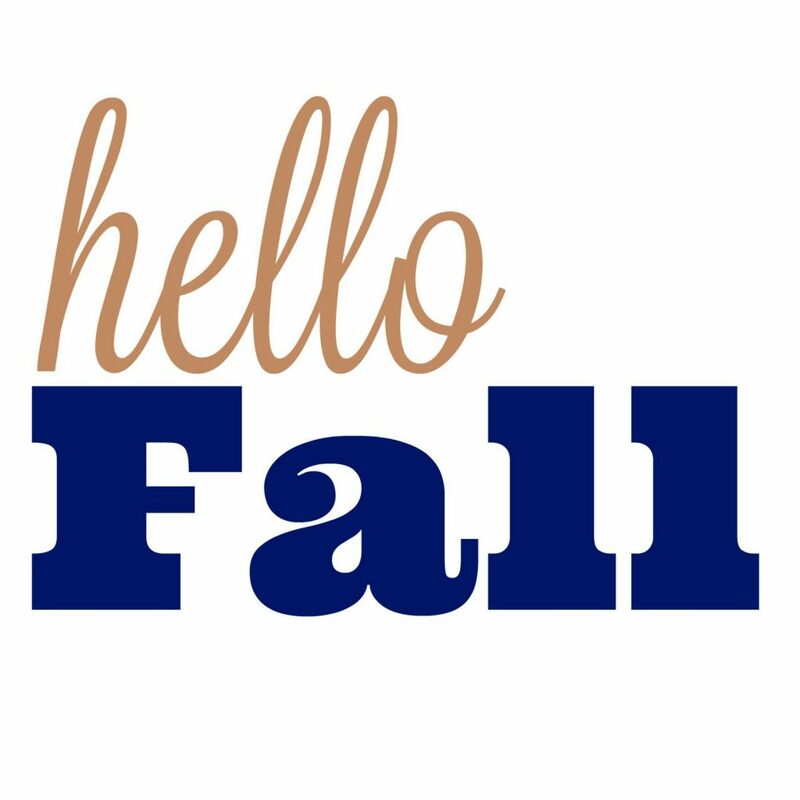 Sign up to get your free Hello Fall Printable! 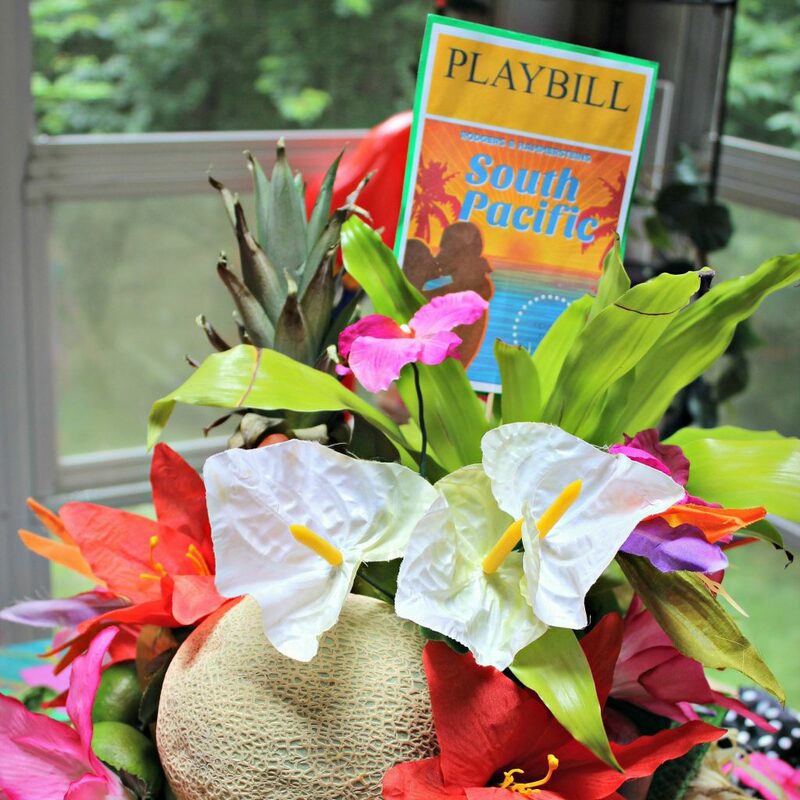 Sign up to get your free South Pacific Playbill Printable! 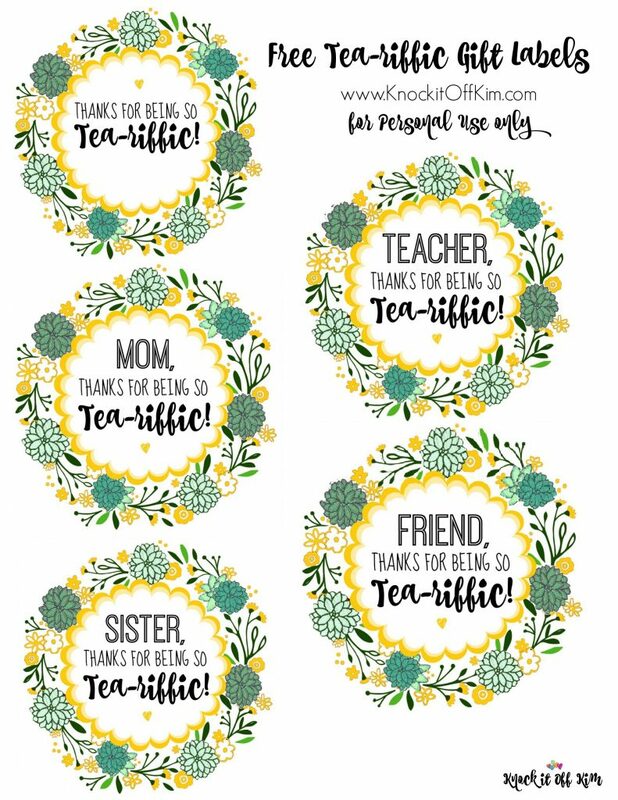 Sign up for your "Extra" Teacher Appreciation Labels! Sign up to get immediate access! Sign up for your Fun and Funky Father's Day Gift Guide! 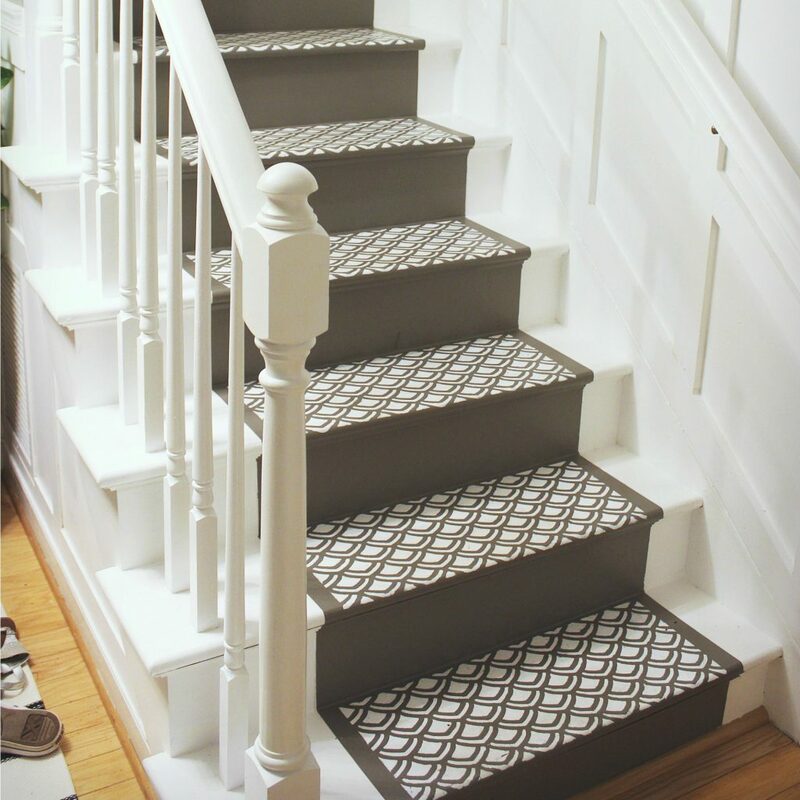 Sign up for to get the PDF tutorial for taking your stairs from wow to holy cow! Sign up for our newsletter to get your printable calendar numbers! 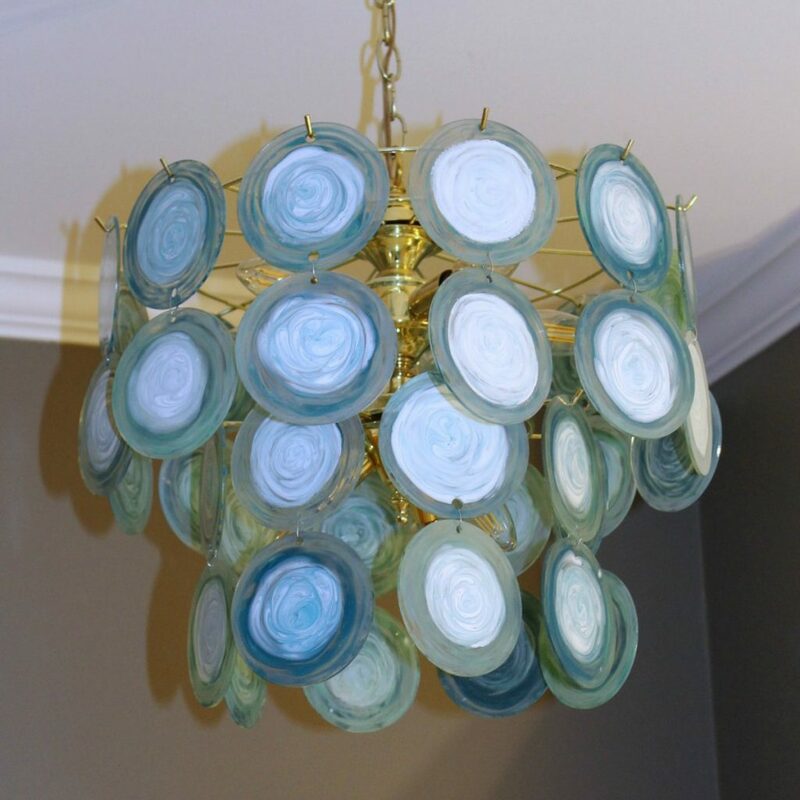 Sign up for to get the PDF tutorial for creating a DIY Acrylic Disc Chandelier! 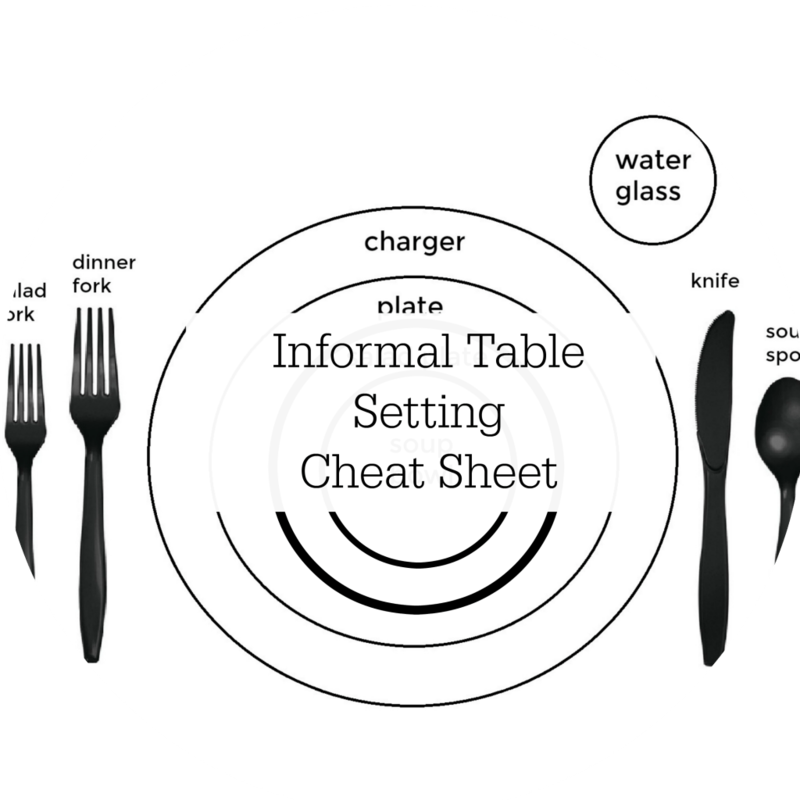 Sign up for my newsletter to get the Informal Tablesetting Cheat Sheet PDF! 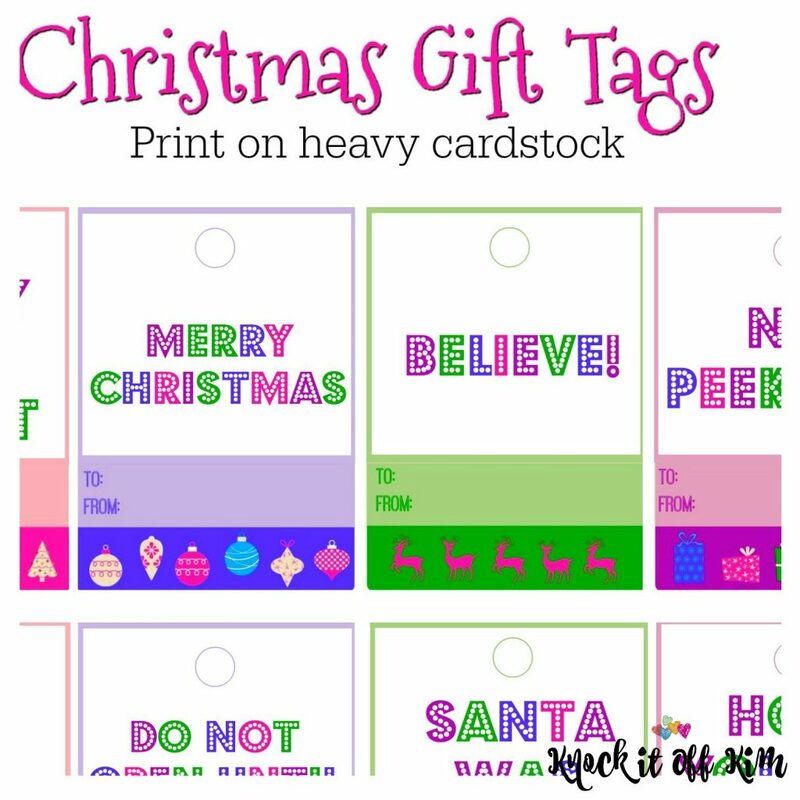 Sign up for my newsletter to get these Christmas Gift Tags! 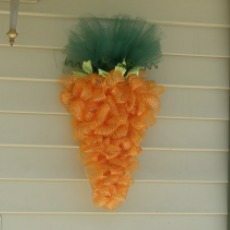 Sign up for my newsletter to get this Carrot Wreath Form Guide! 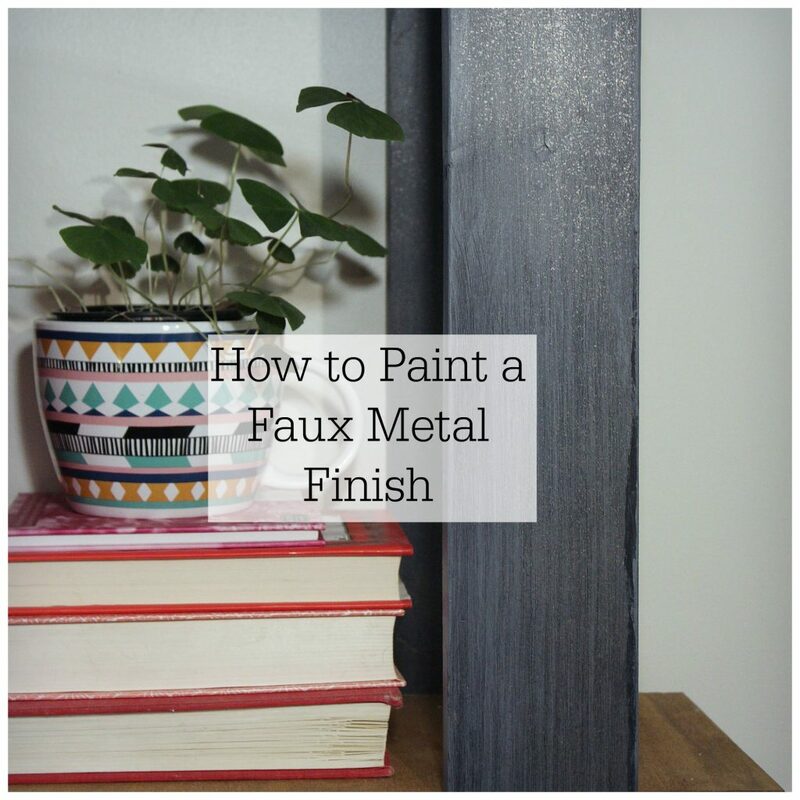 Sign up for my newsletter to get this How to Paint a Faux Metal Finish Guide! Sign up for my newsletter to get the plans and directions for this Floating Table! 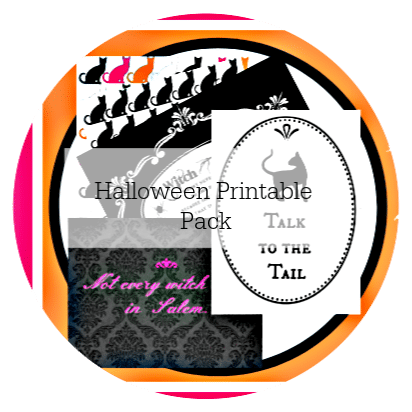 Sign up for my newsletter to get this Halloween Printable packet! 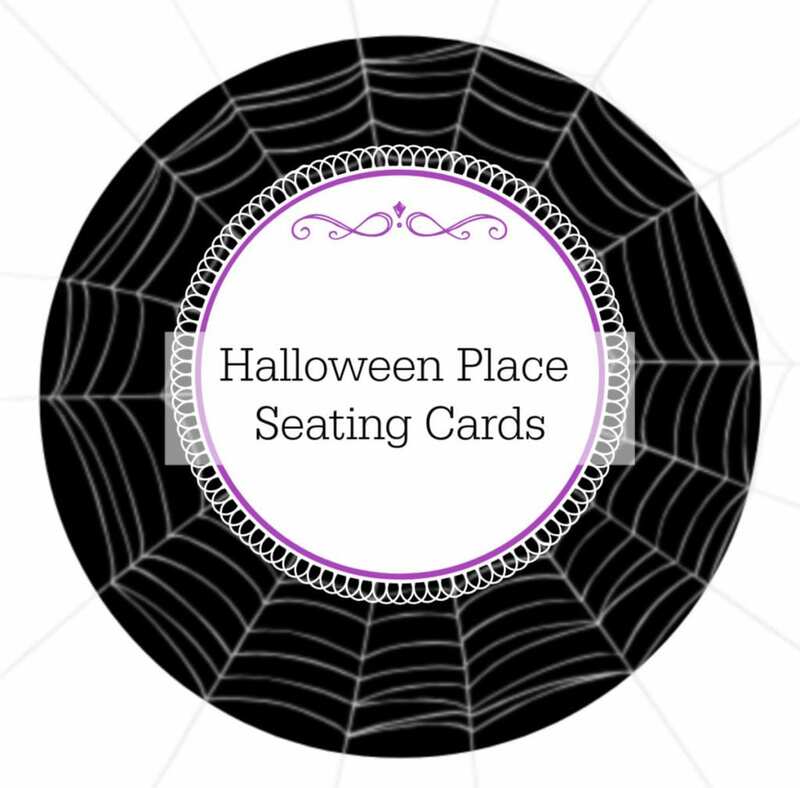 Sign up for my mailing list to get these Halloween Seating Cards! 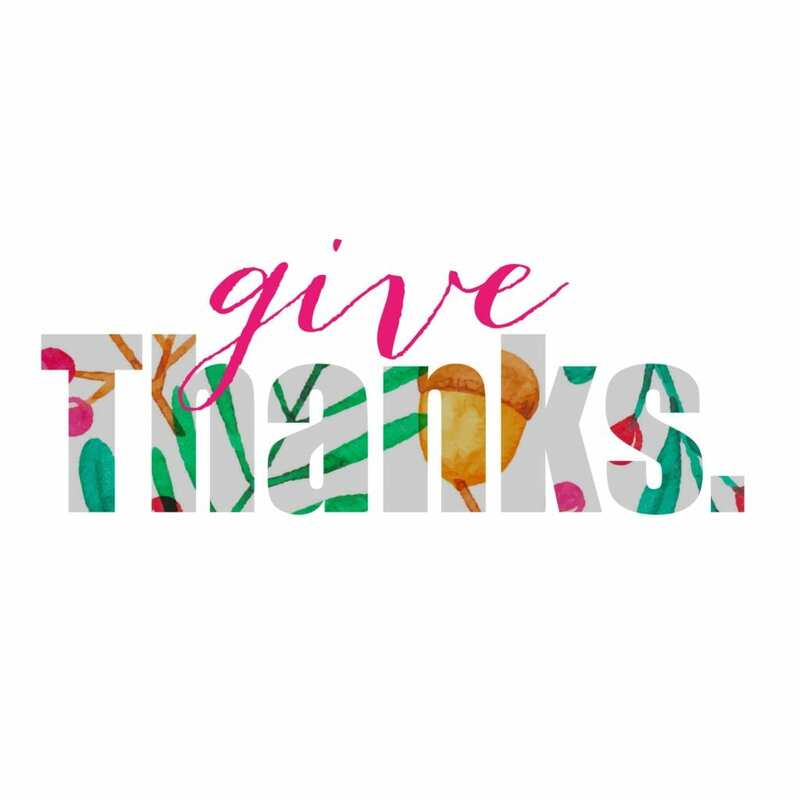 Sign up for my mailing list to get this free printable + one more! Sign up for my mailing list to get this free printable + eight more! 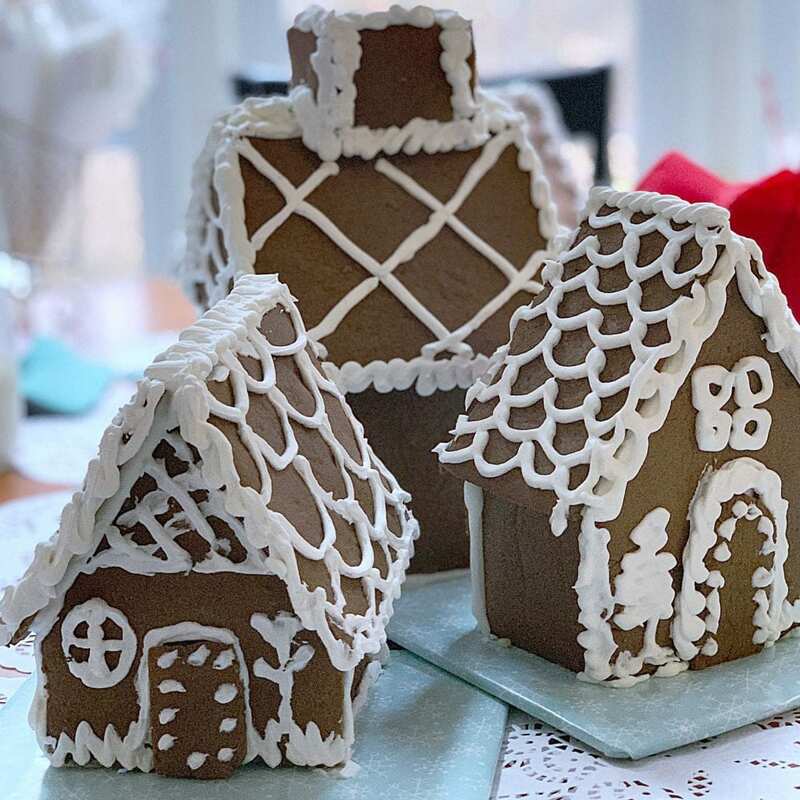 Sign up for my mailing list to get this free set of three gingerbread house patters! 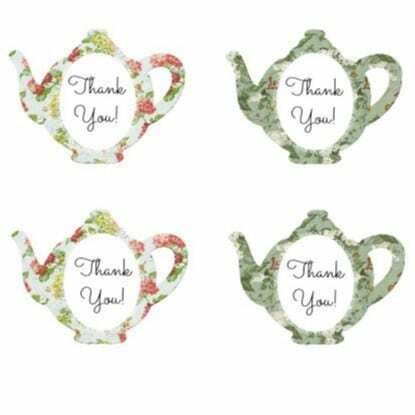 Sign up for my mailing list to get this free set of Teapot Thank You Labels! 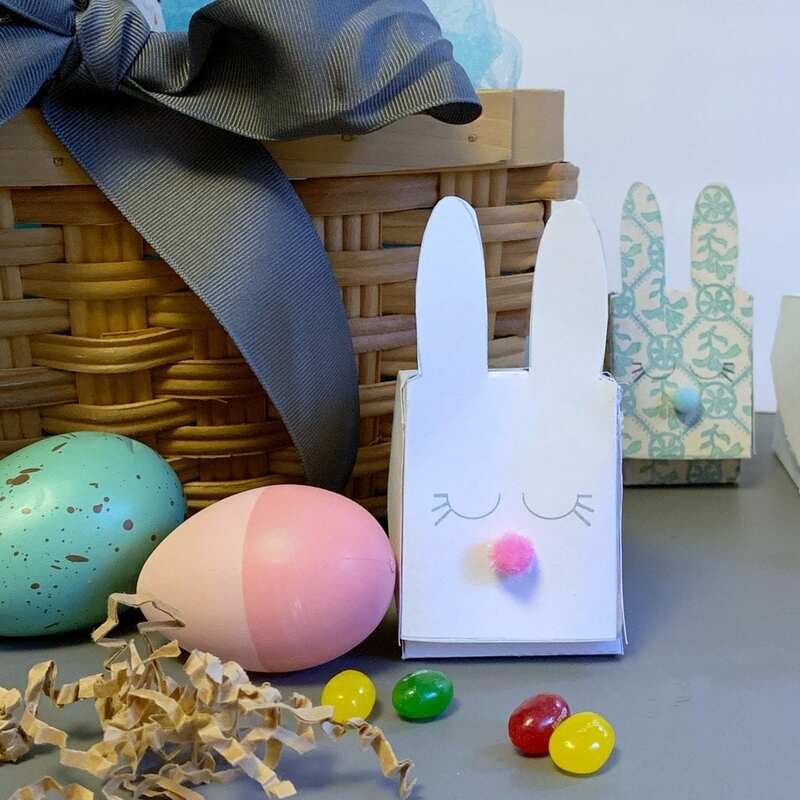 Sign up for my mailing list to get this Free Easter Printable Bunny Box Template! Sign up for my mailing list to get these free Minimalistic Line Art Prints!